Your aquatic playground near the beach. 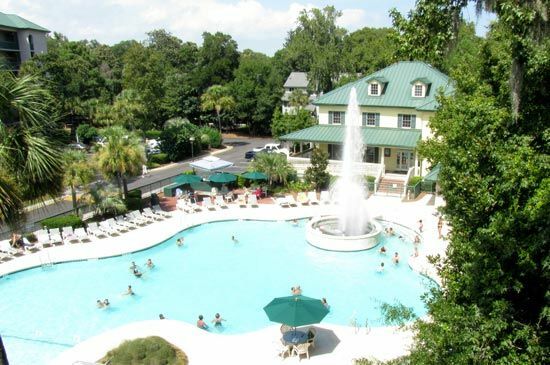 Fulfill your leisure desires and access all island activities from the preserved setting of this Trip Advisor Certificate of Excellence Award 2012 TripAdvisor award-winning Hilton Head Island vacation resort just two blocks from the beach. Waterside resort features one of the largest aquatic facilities on Hilton Head Island and is also 2 blocks from the Atlantic Ocean. Walk to the beach or hop on the shuttle. Dry off long enough to enjoy golf, tennis and proximity to beach restaurants and shops. Waterside guests have complimentary use of a large outdoor pool and hot tub, Activity Center, BBQ area, secondary large pool, childrens’ pool and play area, lagoon gazebo and walkway. Spinnaker Owners can also enjoy daily golf privileges at Port Royal and Shipyard for cart fee only. Tennis is also included at Port Royal. April through October there is a free shuttle to the beach. Additional local offerings are available at special rates for Spinnaker guests. We no longer own a one bedroom condo vacation rental in Building 5800 on Avocet Drive. This building is in the new phases of Waterside Resort. Unit 5811 (Week 32, even years only, Saturday check-in) is a 781 square foot first floor unit, and has a forested view from its patio. Unit includes a washer and dryer, full kitchen, spacious open floor plan, king bed in the bedroom, full bathroom with separate tub and shower, and queen sofa bed in the living room. View floor plan here. Price includes applicable resort taxes and housekeeping fees. Compare at about $1500 per week (source: Spinnaker Resorts rentals).